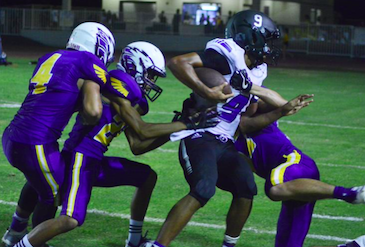 EL CENTRO – The West Hills Wolf Pack had a unique plan to stop the Southwest Eagles on Friday night. And defensive coordinator QUENTIN LONDON’s defense executed it to near perfection against the San Diego Section Division 3 champions on their own turf. West Hills quickly rushed to a two-touchdown lead in the first quarter and the defense made sure that was more than enough against a senior-laden squad. Despite a fumble on the game’s opening series, the Wolf Pack scored just a little more than four minutes into the contest as STEVEN CRISTINI ran 13 yards for a touchdown for a 6-0 lead. Wolf Pack quarterback JORDIN YOUNG had a 22-yards rushing score to move out to a 13-0 lead with 14.7 seconds left in the first quarter. The Eagles scored on a 28-yard field goal with 9:58 left in the second quarter to cut the Wolf Pack’s lead to 13-3, but that would be all the hosts could muster on the scoreboard. “(JAKE) MAHEU and Crisitini played well on both sides,” Ash said. In the third quarter, the Wolf Pack’s BARRETT GAUTHIER ran nine yards for a TD with 1:18 left to make it 20-3. West Hills offensive line was led by the blocking of senior ALEX LEGGATE. Pack senior JACK BROWNING had a leaping interception and long return and also executed a terrific rugby-style punt that pinned the Eagles deep. West Hills junior outside linebacker KIP KLINGERMAN had a true read on the Southwest rushing attack. The Pack had many opportunities to pull away but dropped passes and committed penalties, which stymied their progress on several occasions, according to the head coach. The win over last year’s division champs in the Imperial Valley surely sends a signal that the Wolf Pack are indeed contenders for both a league and section title since West Hills resides in the section’s Division 3 this season. Tthe Wolf Pack (1-0) will play at Valhalla (0-1) at 7 p.m. on Friday. should be a correction…Junior Steven Cristini #21 scored the first touchdown.